One large punnet of fresh strawberries, washed. Boil the kettle.Place the hot water in a saucepan on a stove, and turn on to a medium heat.Break the chocolate into pieces. In a heat proof mixing bowl, place this on top of the saucepan and place the chocolate pieces into the mixing bowl to melt. Stir continuously. 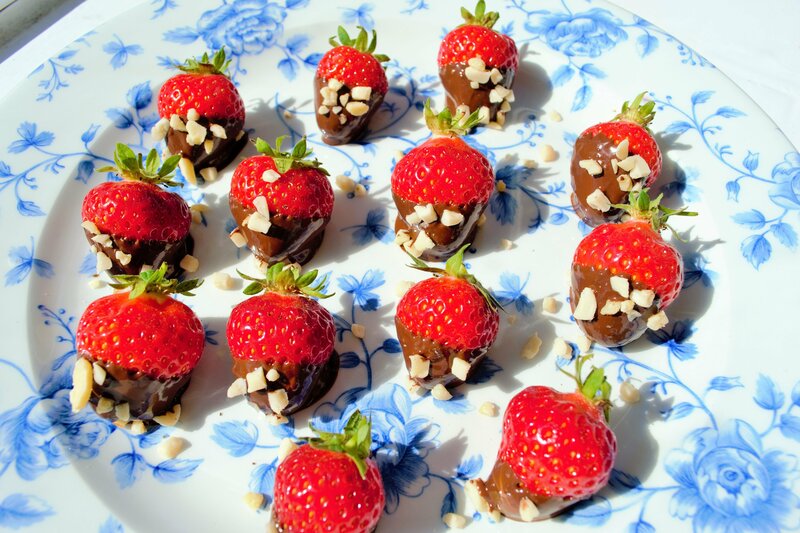 When the chocolate is melted, begin dipping each individual strawberry into the chocolate and then into the mixed nuts pieces. Place these on a baking tray to cool, or alternatively a plate. Put the tray into the fridge for 10 minutes to allow the chocolate to harden and then serve. If you have a nut allergy, you can mix up the recipe by replacing the nuts with dried fruit chopped into smaller pieces, marshmallows or seeds.